Mai Pan Rai literally means “no worries” in Thai language, and quite aptly, Mai Pan Rai bungalows is the place to leave behind all negativities and just enjoy the moments being close to nature. It is safe to say that Mai Pan Rai, sitting on the beautiful and laid-back Than Sadet Beach, is the best place to stay in Koh Phangan. 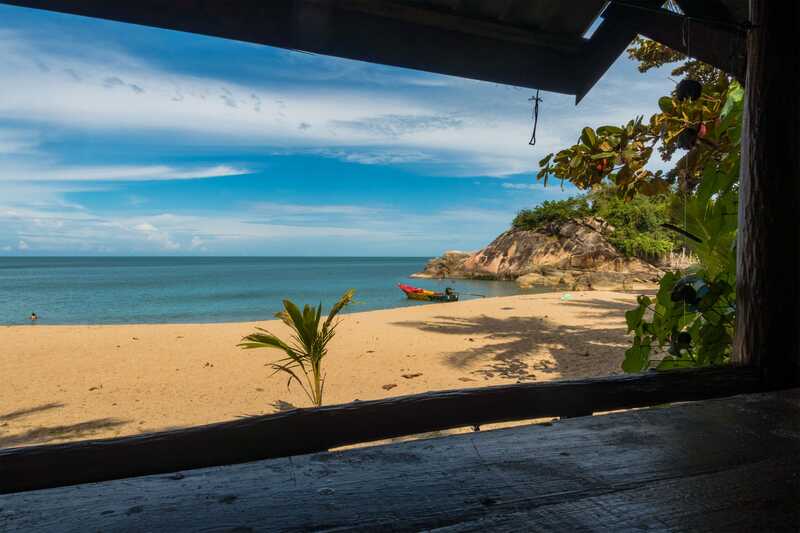 Mai Pan Rai Bungalows is located on the idyllic Than Sadet Beach, part of the Than Sadet National Park on the northeast coast of Koh Phangan. 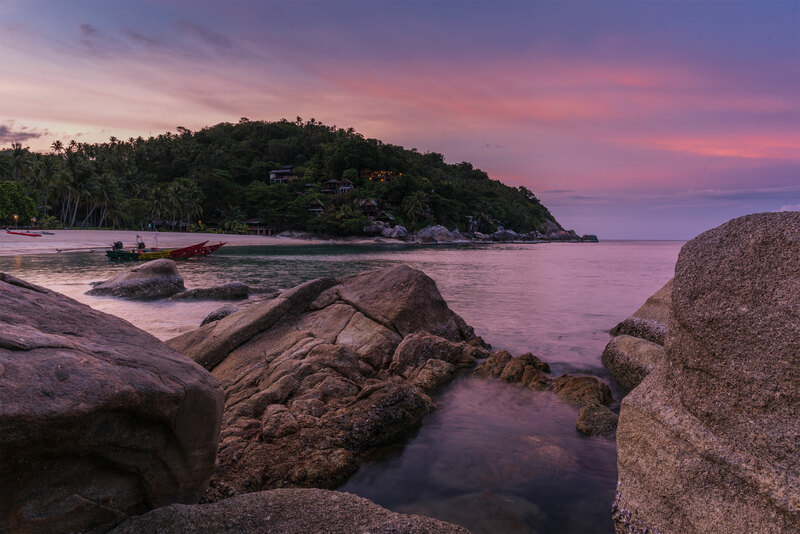 Koh Phangan is a small island in the Gulf of Thailand whose popularity rose because of its famed Full Moon Parties. 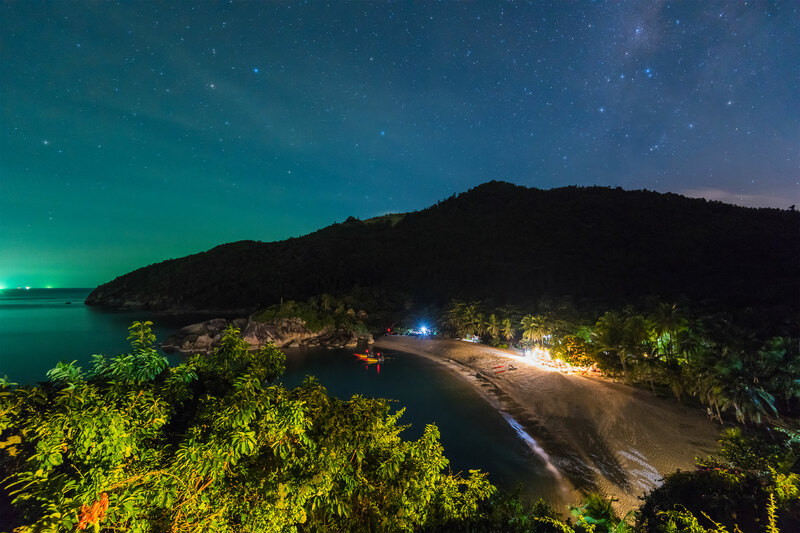 During Full Moon, the island transforms into a mecca for wild party goers. But more than the parties on the island, there are hidden gems that is quite the opposite of what the island is known for. >> Check out our Than Sadet movie ‘My Thai Paradise’! 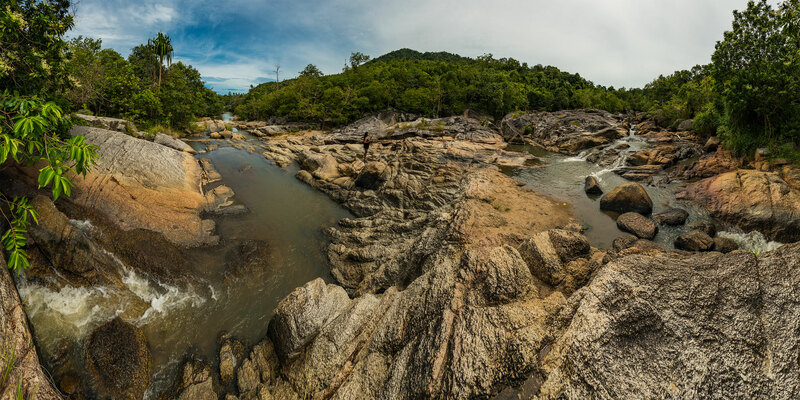 Than Sadet National Park includes the Than Sadet Waterfall surrounded by dense forests which is considered holy by locals as the ancient kings have visited and engraved their mark on the rocks along the river. The river continues to form series of smaller waterfalls and rock pools before emptying into the Than Sadet Bay. Mai Pan Rai Bungalows sits right on the beach and offers rewarding views of the beach and the surrounding nature. 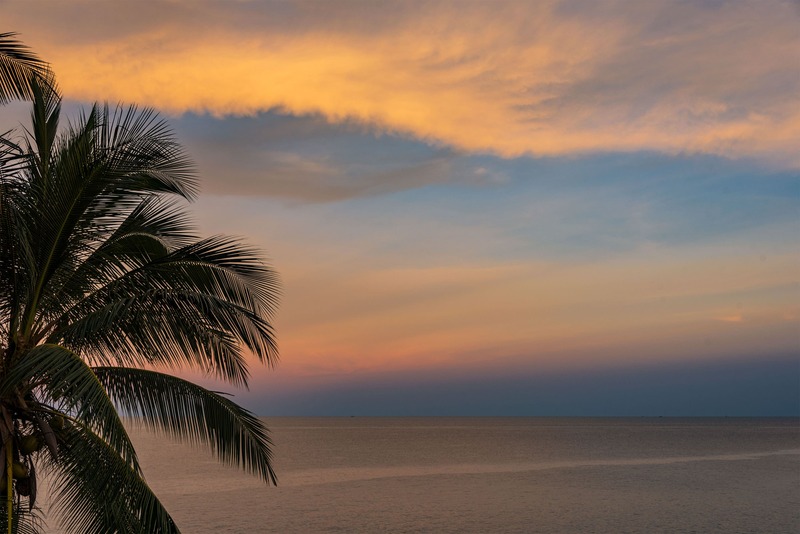 After staying for three weeks in this relatively secret getaway, we found 8 reasons why we love Mai Pan Rai Bungalows and why it is the best place to stay in Koh Phangan. Each of the Mai Pan Rai bungalows are strategically located to offer spectacular views of the white sand beach of Than Sadet Bay, the blue sea, the huge rock boulders, and the forests surrounding the relatively hidden spot. They even have bungalows right next to a river where you’ll be treated with sightings of huge monitor lizards swimming about in the river. From the bungalows on the cliffs and the restaurant on the beach, one can be treated by a nice sunrise. The bungalows are made of mixed materials whose styles are made to compliment the unspoiled nature they’re built on. Some bungalows are built on the rock with the view of the sea, some on the beach, and others on the river. Each of them is built differently so that no two bungalows are the same but still with the same amazing views of Than Sadet. Just imagine waking up in the morning to see impressive views from your own bungalow. Some might be outdated but the overall cleanliness and comfort is definitely not compromised. Most of the bungalows have hammocks outside so you can just relax while enjoying the sights around you. Mai Pan Rai Bungalows is sitting on the secret beach of Than Sadet and on the massive jutting rocks on its sides of the bay, tucked away in a thick forest on the east coast of Koh Phangan. The nearest town with shops is located up north, about a 10-minute drive. To get Mai Pan Rai Bungalows on Than Sadet Beach from the main port in Thong Sala, just get on a mini van or a taxi for 150-`300 Baht and they will take you there, which is about a 30-minute drive through winding and hilly road. Likewise, there are boat taxis from Thong Sala or anywhere in Koh Phangan that can drop you off Than Sadet. Because of its location being far away from towns and other accommodations and shops, Than Sadet is usually only visited by day trippers, leaving the guests of the Mai Pan Rai Bungalows to enjoy the beach for themselves during off times. 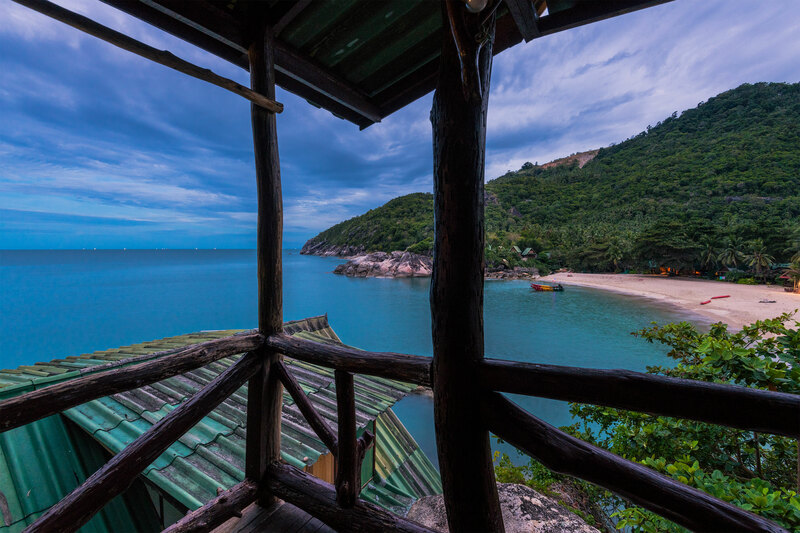 The secluded location definitely makes it the best place to stay in Koh Phangan. The restaurant sitting right on the beach has a very relaxed vibe, funky designs, and great music, perfect to relish their delicious meal while enjoying the view of the beach. The menu consists of mostly Thai dishes that really compliments the location. 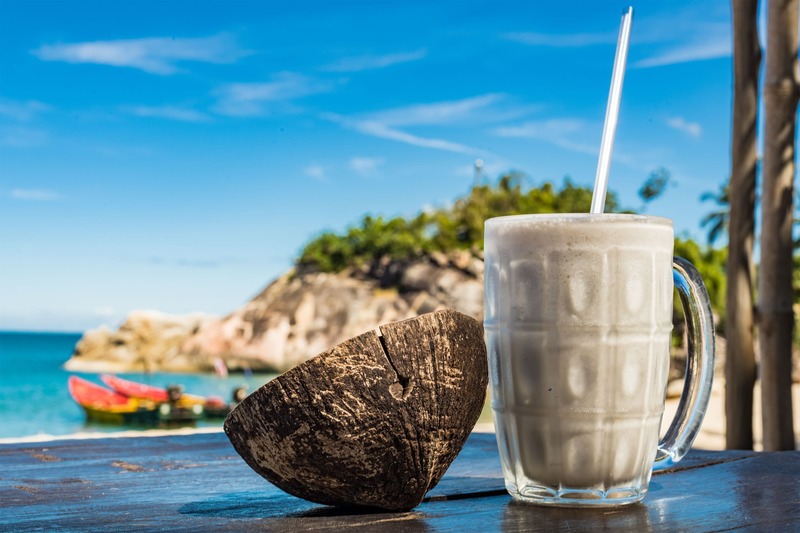 Our favorite is the curry and the coconut shake which is made of fresh ingredients. They also have a couple of Western food and even a kid’s menu. Grab a cold beer or a cocktail after swimming on the beach and just indulge on the views. Another reason why Mai Pan Rai Bungalows is the best place to stay in Koh Phangan is the fact that it sits right on Than Sadet beach. The beach in Than Sadet is considered one of the best places to swim in Koh Phangan due to the fact that the water goes deep quickly so you don’t have to walk far especially during low tide. The water is fresh and cool. The white sand is a mix of coarse and fine in different parts of the beach. It is perfect for sunbathing. Than Sadet beach is fairly secluded from other parts of Koh Phangan so you will have a quiet and relaxed atmosphere almost every day. Jump off from one of the huge rocks bordering the bay and enjoy a plunge into the cool water. Thais are known for their smiles and friendliness. That’s exactly what we got in Mai Pain Rai Bungalows. Every one of them is friendly and hard-working. 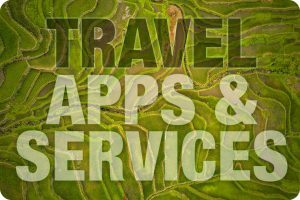 Although, some of them might seem indifferent which is mostly because of their lack of English, their services are still topnotch. Pen, the manager, is always there to assist anyone and to make sure that our stay was great – from transfers, arranging tours, to changing rooms if you have preferences. Fiona, the owner, who comes to visit every weekends, is lovely to talk to and would share the story of Mai Pan Rai Bungalows. Because Than Sadet is still relatively hidden, with the main road just recently finished, only a small amount of people actually come and stay at Mai Pan Rai Bungalows which is almost a guarantee of a peaceful stay. In our stay, we’ve seen couples and families with children and elder members of the family. It is a perfect place for intimate, quiet moment for couples or a fun and safe place for children to play, swim, and explore. 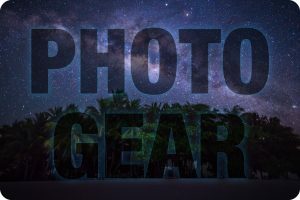 Solo travelers, yogis, and artists looking for some quiet time and inspiration are on a treat too as they reconnect with nature. The Orion Tours offered by Mai Pan Rai Bungalows was probably one of the best boat tours we’ve been on. 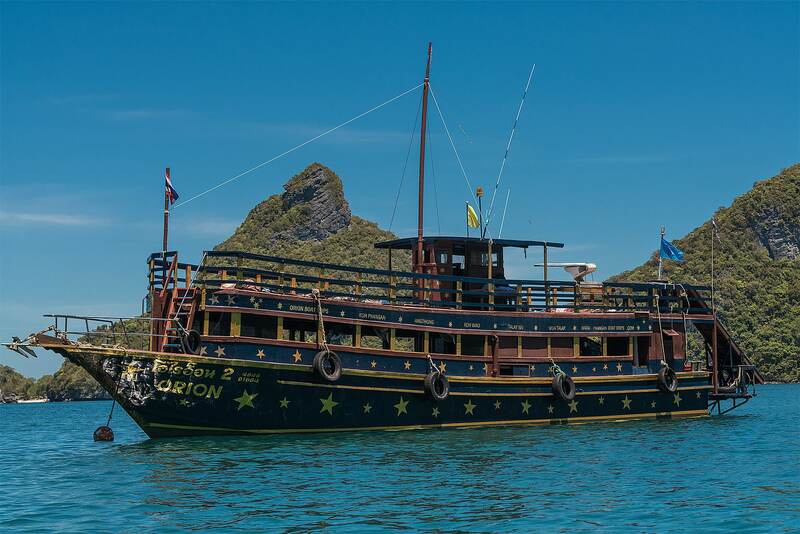 The Orion boat will take you to the Ang Thong National Marine Park which is home to diverse marine life and lime stone rock islands that dot the incredibly blue waters of the Gulf of Thailand. The hikes to the hidden lagoon and the view points are worth it. You can book the Orion tours through Mai Pan Rai Bungalows or from their main office in Thong Sala which also offers other boat tours and boat tickets to other destinations. The boat itself is huge and spacious with plenty of room for people to walk around. The unique boat boasts a diving board and a slide. We can’t spot a fault with the spot. They are very alert, friendly, and fun on the boat and are always gracious to help us with anything we need. The food offered on the boat were tasty and more than enough. Start off with cookies, fruits, and coffee in the morning; a lunch with curry, chicken nuggets, stir friend veggies, and fresh fruits, with different soft drinks, and for afternoon, you can build your own tuna sandwich. The end tours with an awesome sunset while on the boat. Mai Pan Rai Bungalows also offer boat taxi to go to Full Moon Party for 600 baht per person. The small boat is enough to take you safely to the popular Koh Phangan party in Haad Rin Beach. They also offer snorkeling gear and kayak rentals, and car rentals are also available. Overall, Mai Pan Rai Bungalows is the best place to stay in Koh Phangan because of the idyllic views, the perfect location, the unique bungalows, the delicious food, the relaxed vibe, the beach perfect for swimming, the friendly staff, and the services and tours they offer. We definitely recommend anyone going to Koh Phangan to stay in Mai Pan Rai. Wow this place is gorgeous! I always hear about Phuket and other cities in Thailand but I think I’d rather go here first. Smart choice, I’d really skip Phuket! The Mai Pan Rai Bungalows sounds like exactly the place I would want to retreat to, to get away from the hustle and bustle of cities and technology! 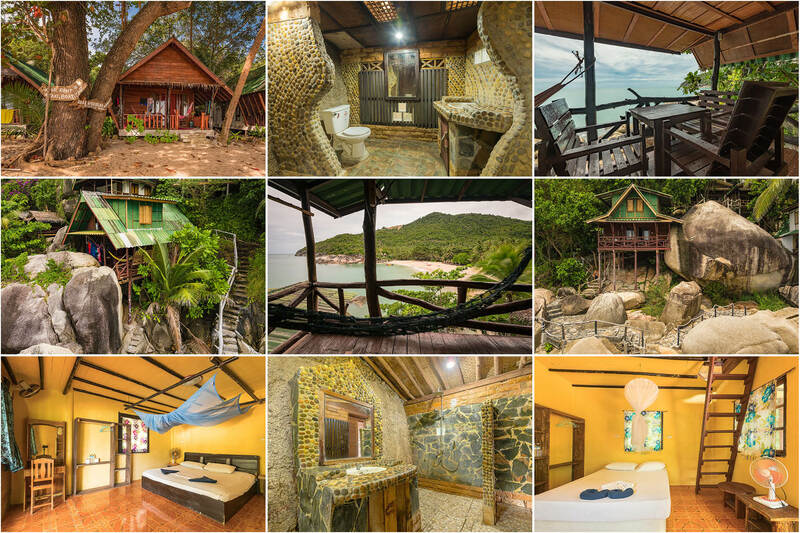 Your pictures of the bungalows and surrounding areas of Koh Phangan are amazing – great review! Wow! 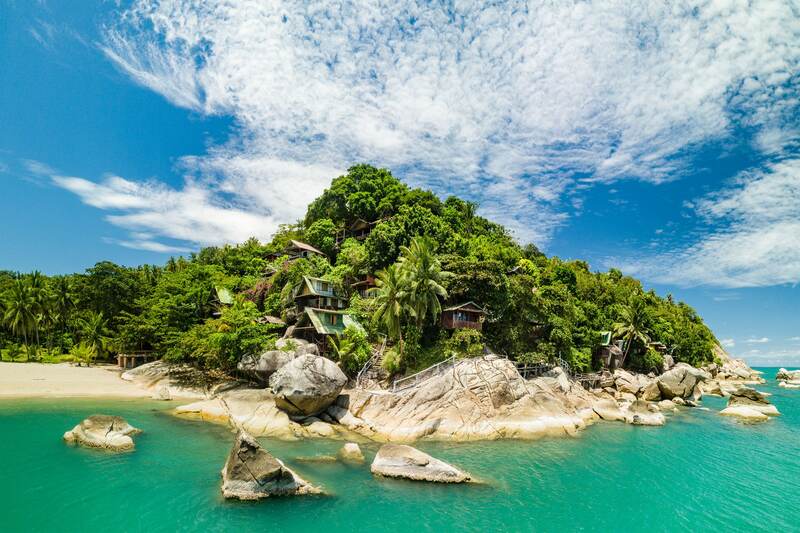 Koh Pangan looks incredible. I have been to Thailand many times but never to Koh Pangan. Will be putting it on my bucket list. It’s not the party place you’d expect. There’s parties ofcourse, but most is actually rather quiet. As a budget traveller, I can only envy you. 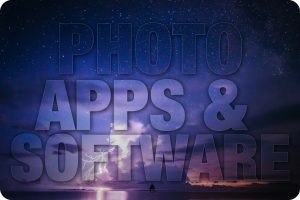 The pictures are beautiful. The one of the bathroom made me chuckle as the WC looks really out of place in that pretty decor. I travel solo so I dont’ know if I want to be by myself here but if I travel with someone, I would probably want to check this place out. 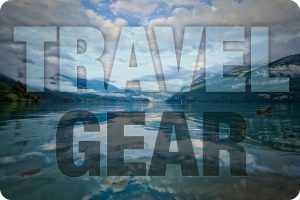 I travel budget too 😉 Offer something good and you might get it for free! Mai Pan Rai Bungalows at Than Sadet beach look idyllic! From the view of the balcony to the ambience of the bungalows, and the perfect location, it is very inviting! Have heard of Koh Phangan a lot and have to visit there. Would keep in mind this amazing recommendation for a perfect trip, even more so, since the area is not yet ventured by many. It is a beautiful little spot! This looks gorgeous, I didn’t get to visit this place when I was there but will have to add on my list whenever I return! This looks like paradise! I’d love to visit Thailand someday, and Koh Phangan is definitely on my list. These bungalows look perfect! Simple but perfect. Who needs tv when you have a view like that, right? Wow!What a stunning spot right on Than Sadet beach as well. I love Thailand so I have bookmarked this for my next visit. Thanks so much! I have so much love for Koh Phangan! Has such a beautiful hippie vibe! Will def check these places on my next trip! Wow, this place looks absolutely amazing. I sure wouldn’t mind spending a few days here. Thank you for sharing!